The Government of the Central African Republic and 14 armed groups inscribed their initials on the Centrafrique Peace Agreement in a ceremony in Khartoum. Rival parties from Central African Republic (CAR) on Saturday reached agreement on the two serious bone of contention, power sharing and interim justice, thus paving the way for a final and comprehensive peace agreement in the landlocked state. 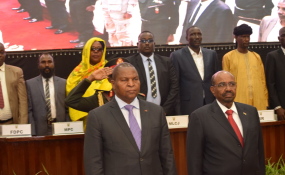 Ambassador Atta Al Manan Bakheet, head of the Sudanese team facilitating the talks under the auspice of the African Union, said the two sides, the government and 14 armed movements, have agreed to the proposals put forward by the African Union, on power sharing and on the interim justice. He said this was a result of high level contacts led by President of the Republic Omar Bashir, including a Friday phone call on Mr. Faustin-Archange Touadéra, president of CAR, and also contacts with the leaders of the armed movements from CAR. The two sides, the ambassador told the Sudan News Agency, will sign with initials the draft agreement in Khartoum on Sunday, in the presence of President Omar Bashir and of CAR President Faustin-Archange Touadéra. The ambassador revealed that in addition to CAR Minister for Presidency chairing the government side in the talks, the Minister of Defense and the Minister for Foreign Affairs as well as the Minister for Justice and the Minister for Social Welfare were all attending the Khartoum talks on behalf of the government in Bangui while the 14 rebel movements were all presented at the level of the leaders of other top senior officials.